Highlands Reserve - Luxurious 4 Bedroom Home with Private Pool. Located on the prestigious Highlands Reserve Gold Resort, just 10 minutes from Disneyworld, the impression of space and luxury will be apparent from the moment you enter this home. The airy, open plan layout features a great room with vaulted ceilings, elegant dining room and eat-in kitchen. The bedroom accommodation is split between a sumptuous king master suite on the ground floor, plus a queen bedded guest room and two twin bedded rooms upstairs. Outside, guests will enjoy a huge sun deck, large pool with winter heating plus a shady lanai for alfresco dining. Be wowed by the feeling of space and light in our huge great room with vaulted ceiling and love the unique open fireplace and floor to ceiling windows. Sink into two sumptuous luxury sofas, dine at the colonial style dining table in the spacious dining area, eat alfresco under the lanai, or breakfast/ snack at the bistro area in the large, well-stocked kitchen. Equipment includes stove, oven, microwave, dishwasher and refrigerator with ice-maker plus flatware, glasses and crockery. Walk through the patio doors and onto the huge sun deck and dive into the cool, blue, refreshing pool or just relax in the sun on the many loungers (beach towels provided). The spacious master suite is on the ground floor and features a King sized bed. The en-suite bathroom has a double vanity, walk in shower and roman tub. Upstairs the queen bedroom overlooks the pool at the rear of the property. Two bright and airy twin bedded rooms at the front of the home complete the line up. Last but not least, for the competitive in your party check out the game room featuring pool and table football. For the little ones a high chair, car seat and stroller is provided. This 18 hole, par 72 golf course gives you pine tree fairways reminiscent of the Carolinas. The clubhouse is a friendly place open for snacks and manned by professional golfers, providing all the golf lessons you need.The tree lined boulevards are a safe environment for children, and boasts tennis courts, community swimming pool and play area, and all this within walking distance of Berry Town Centre which has a Publix supermarket and a range of tasty take-always ranging from fish and chips, to Japanese fine dining. Highlands is wonderfully placed alongside Highway 27 and just off highway 192, close to all the Disney attractions, with Interstate 4 just minutes away provides easy access to Tampa, Clearwater and the West Gulf Coast, or the East Space Coast beaches near Cocoa and Melbourne, and the Kennedy Space Centre. All Central Florida attractions from the lakes at Claremont to the Everglades to the South are within easy reach, suiting fishermen, thrill seekers or sun-worshippers. Golf: The prestigious Highlands Reserve Golf Course Community is situated on Highway 27, ideally located just off Highway 192 for easy access to all the major attractions. Interstate 4 is just minutes away providing quick access to the beaches near Tampa on the Gulf to the West, or the Atlantic East resorts of Cocoa beach and Melbourne. It sits atop one of the highest areas in Florida and offers remarkable scenery along with a course designed for hot golf! This championship 18 hole par 72 course gives you pine tree lined fairways reminiscent of the Carolinas, open spacious fairways likened to the great Scottish courses and a bit of old Florida with citrus trees and large undulating greens making this course challenging and fun for all levels of golfers. It has a club house, pro shop, café and snack bar and all within 5 minutes walk from the house. There are 30 more golf courses within an hours drive of the house, all with their own characteristics, and occasional alligator! We stayed at this villa for 3 weeks in April 2017, our second vacation here in the past 3 years. It really does feel like a home from home, and most certainly doesn't feel like a normal 'rental home'. We booked directly through the owners, Roger and Sue, and nothing was too much trouble for them. We only had one little problem during our stay, and the management company were brilliant and it was solved within a couple of hours. Must also give praise to the management company, the villa was spotless, they obviously take a lot of pride in looking after their homes. Would we recommend thus villa to friends and family - yes we would, and we will be back next year. I have stayed in this beautiful villa twice now & have booked for 3 weeks in May 2018. 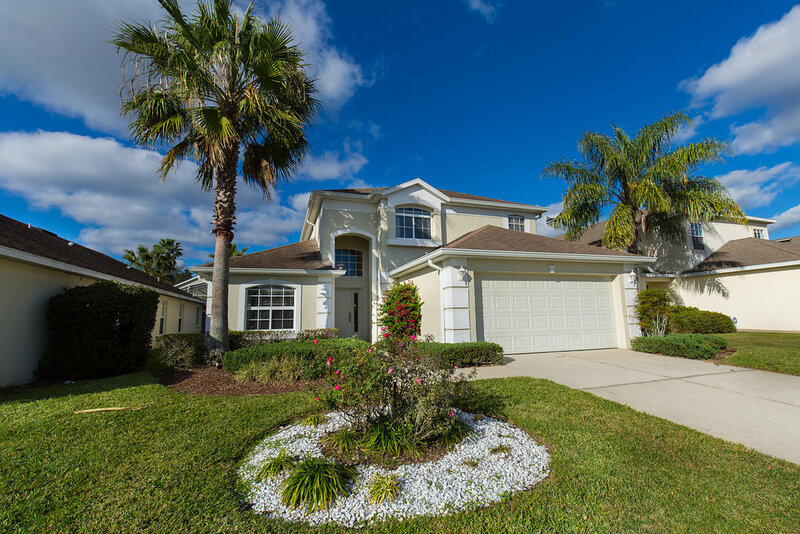 It is the BEST villa I have ever stayed at in Orlando and is on the best community..Highlands Reserve. The owners Sue and Roger ensure their property is maintained to a high standard. Everything you could possibly need to make wonderful Disney memories, is within easy reach....Disney itself is just 15 minutes by car. A perfect retreat after a long day in the parks & I can highly recommend & personally wouldn't stay anywhere else! Stayed at this villa in January 2017, exactly what it says in the description. Obviously the owners have taken great care to make this a home rather than a rental investment. Would recommend to any prospective vacationer - great value when compared with other villas on offer.